Nestled at the confluence of two rivers, ancient royal capital Luang Prabang retains a unique ambiance. Amongst many of Luang Prabang’s gilded temples (wats), visit one of the most beautiful, 18th century Wat Sene (‘Temple of a 100,000 Treasures’). After making offerings here, participate in a Buddhist blessing ceremony. We cruise on a traditional boat along the Mekong River to Pak Ou Caves. Here, elevated high on a limestone cliff, these two grottoes house 4,000 Buddhist statues and images. 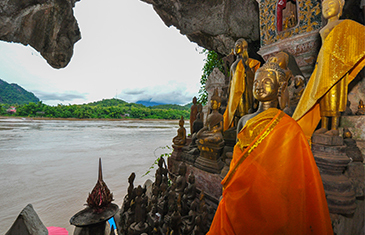 Worshippers, including Lao royalty, have visited this revered cave-temple for centuries. To commemorate Luang Prabang’s 20th Anniversary as a UNESCO World Heritage Site, ‘A Walk through the Heritage of Luang Prabang’ guidebook was published to highlight the town’s magnificent heritage aspects. 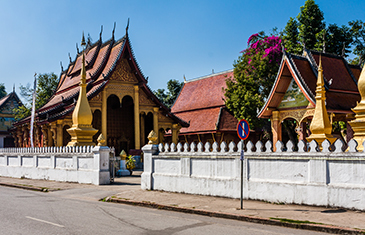 With book in hand and accompanied by a local guide, take a unique walking tour of Luang Prabang. Atmospheric narrow streets reveal distinct Indochina-era and Lao-style architecture. 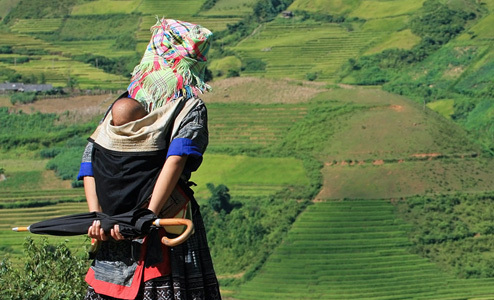 Beyond Luang Prabang, learn about the deep-rooted significance of bamboo in Laos culture. Our guide will explain bamboo’s traditional and modern uses, from fish traps to roof thatching. Join classes in both bamboo weaving and bamboo-inspired cuisine within a traditional, pavilion-style dwelling immersed in rice paddies. Later, explore one of Luang Prabang’s most picturesque attractions and the region’s biggest waterfalls, Kuang Si Waterfall. Take a leisurely hike through jungle parklands to reach the cascading tier of waterfalls, dropping into spectacular azure pools. At nearby Kuang Si Bear Rescue Centre, see bears rescued from wildlife traffickers and traditional medicine traders. A guided tour shows us what can be done to protect one of Laos’ most endangered species. Laos capital and former French Indochina trading post, Vientiane, still exudes an ‘Old World’ charm. Tree-lined boulevards, low traffic density and a historic Old Quarter also makes Vientiane an ideal city to explore by foot. We discover some of Vientiane’s most significant landmarks. Wat Sisaket is one of the capital’s oldest surviving temples, embedded with thousands of tiny Buddha images, That Luang, a 44m (147ft)-tall, gilded Buddhist stupa, is regarded as the nation’s most important monument and Patuxai Victory Monument ranks as a city icon. Later, visit the home-studio of an American textiles expert, established to preserve traditional Laos weaving techniques. Now employing 40-plus weavers, Lao Textiles Studio produces naturally dyed and woven silk pieces inspired by age-old Laotian designs. Our overland border crossing from Laos into Central Vietnam brings us to the Imperial City of Hue, from 1802 to 1945, Vietnam’s capital and home to a Nguyen Emperor dynasty. Today, Hue’s majestic past and historic legacies are still evident, with a complex of ancient monuments collectively listed as a UNESCO World Heritage Site. 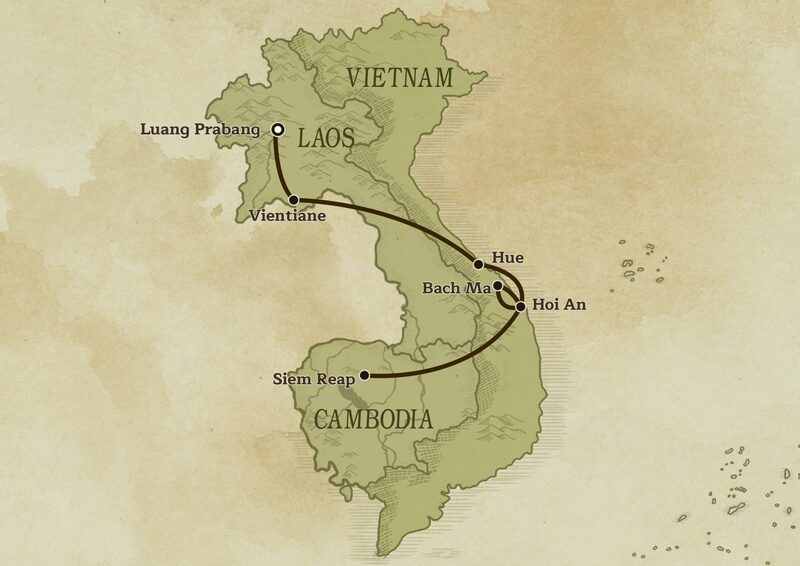 Explore Hue’s key highlights. As Vietnam’s centre of Buddhism, Hue boasts numerous pagodas, but the best preserved and most historic is Thien Mu Pagoda. With its seven-storey octagonal tower set on a riverside hillock, this 17th century pagoda-monastery is an iconic landmark. Next, choose between two important city attractions. First, 19th century Imperial Citadel, a magnificent walled complex containing the Imperial Enclosure, Forbidden Purple City and Flag Tower. Alternatively, stunning Ming Mang Royal Mausoleum, one of several Emperor’s tombs hidden amongst hills. Later, visit Duong No Village, the rural childhood home of former President Ho Chi Minh. From Hue, an early morning drive by jeep deep into the heart of Vietnam’s north-central countryside takes us to Bach Ma National Park. Originally a French colonial-era hill station, Bach Ma’s protected 22,031ha (54439ac) of parklands stretches from coastal plains to soaring mountains. One of Indochina’s key bio-diversity centres, Bach Ma is habitat to diverse fauna and flora species and native wildlife includes rarities such as the Douc Langur. 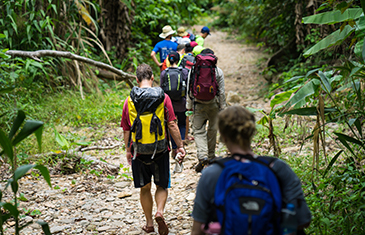 A local forestry expert, whose in-depth knowledge and passion for Bach Ma has endured for two decades, leads us on a three-hour trek through sub-tropical rainforest. 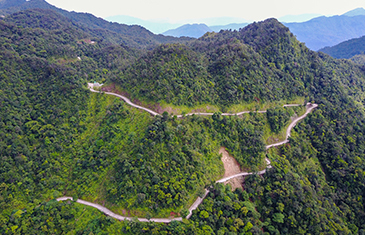 We reach magnificent Ngu Ho Lake and Do Quyen waterfall and later, ascend Bach Ma’s highest mountain, 1,450m (4,757ft) above sea level, for breathtaking views. Formerly known as Faifo, Hoi An was a major ‘Silk Road’ trading port from the 16th to the 19th centuries. One of South-east Asia’s oldest towns, UNESCO World Heritage Site Hoi An is popular for its beautifully-preserved historical sites, antiquated ambiance and culinary heritage. Explore the bucolic countryside surrounding this ancient town by bicycle – still a preferred local form of transport. Cycling along the Bon River, get up-close glimpses of colourful fishing boats and rural communities. Continue to Thuan Tinh Island, an ‘ecological zone’ immersed in tropical foliage, which is the epitome of self-sufficient rural life. Peaceful inland trails passing fish farms and rice paddies lead to Cua Dai Beach and Cam Thanh, a quintessential fishing community. Indulge in a relaxing afternoon on An Bang Beach. With its narrow, pedestrianised streets alongside Thu Bon River, Hoi An’s historic Old Town quarter is best explored on foot – revealing a glimpse of its illustrious past. Many of Hoi An’s atmospheric old buildings are clustered here, a fusion of Vietnamese, Chinese, Japanese and European architectural influences, legacies of trading merchants settling here. Our guided walking tour passes some of the town’s most prolific ancient sites. These cover several Chinese merchant shop-houses, colourful temples, such as the Assembly Hall of the Chaozhou Chinese Congregation and 16th century Japanese Covered Bridge, Hoi An’s iconic emblem. Our day concludes with a one-hour boat trip along Thu Bon River, gliding past fishermen casting their nets and riverine hamlets. In northwest Cambodia, Siem Reap is gateway to Angkor Archaeological Park, a UNESCO World Heritage Site containing the stupendous remains of an ancient Khmer civilisation. Explore the lesser known, but still impressive ancient masterpieces within the Park. These include Banteay Kdei, home to a rare, ancient Buddha statue and Ta Keo, a 22-metres (72ft)-high, five-layered mountain temple, constructed from the 11th century but still half-built. The afternoon continues with forays to remarkably peaceful temples: Preah Khan, a sprawling complex, constructed in the late 12th century and neighbour, Neak Pean, a Buddhist island temple. We also visit Ta Som, where overgrown fig trees burst through the temple’s stone ruins. At our final stop, Pre Nup, enjoy magnificent views from the temple’s elevated vantage point. Leave Siem Reap far behind, driving out to remote countryside and an authentic Khmer village, Peak Sneng. 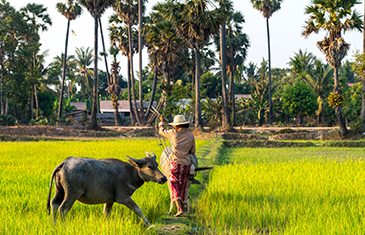 A visit to this peaceful community lends a rare opportunity to experience the daily lives of Khmer people and their simple rural traditions. 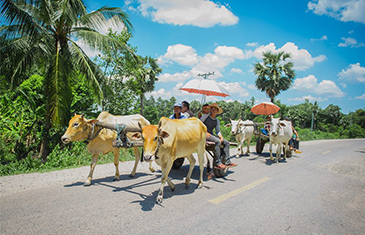 Stroll through the village, stopping at the local school to meet students, ride on local transport and learn about time-honoured handicrafts from artisans, such as palm leaf weaving. Our visit however also benefits the village, with proceeds from the tour directly impacting the villager’s lives in a positive way. Highly appreciated donations contribute to the villager’s most pressing needs, from school computers to a new roof for an elderly resident’s home. Our adventurous cross-border journey covering Northern Vietnam and Northern Laos takes intrepid travellers through some of South-Asia’s most spectacular and remote regions of soaring mountains and lush river valleys, encountering ethnic minority villages and inspiring ancient capitals.